She worked in Production Coordinator and Wardrobe in Walter Perez‘s Into The Night Dollar Baby Film. Christijana Mora: Hi! My name is Christijana Mora, I led the Wardrobe dept, Snow, and am one of the Production Coordinators on the film ‘Into The Night’. Christijana Mora: I became involved in ‘Into The Night’ when I met Walter through my husband, Marc Mora (one of the producers). Learning that they needed help on the film and seeing this as an exciting experience, I couldn’t say no! SKSM: In this production, you worked as a Production Coordinator and Wardrobe – What was that like? Is this something you want to venture further into the industry? Christijana Mora: Working with multiple Production Coordinators was a relief in this film. As a coordinator, your skills for multi-tasking are always challenged. But with help, the load of the work was made more fun than stressful. Now on wardrobe, we had to come up with some creative ways to tell the genre without losing the essence of the horror and I think we were able to grasp that. Since working on this film, it definitely has me wanting to venture even more into period pieces and to fine tune my creative eye for more ideas on set design and wardrobe in the future. SKSM: Can you tell us more about your work in the film? Christijana Mora: I also took on the role as “Snowmaster” during the filming of ‘Into the Night’. With my experience with fake and the real thing, I was able to recreate the look and effects of this harsh element. Working with hot and cold temperatures is always a risk, but our cast and crew were troopers and pulled through. A big thanks to SNOW BUSINESS HOLLYWOOD for all their help. Christijana Mora: Working with Walt was really easy. But it was all worth it, he really pulled through to making this script become the real deal. Walter was always there, whenever I needed a second opinion and great for the catch up talks. I think we all walked away with something learned. Also, I couldn’t thank him enough for giving me the opportunity, so I’ll be always grateful for that. 🙂 Looking forward to the next one Walt! Christijana Mora: For funny things while shooting? Well, there’s always the occasional background sounds we pick up, when we were on locations that were out of our control. Christijana Mora: So I actually missed out on reading his books when I was little, the Goosebumps books from R.L. Stine were more my level of spooky back then. More or less Stephen King was something that I realized I watched on tv and didn’t know it was until later. He definitely has that real Adult scare factor down. My husbands more of a super fan, so I’ve actually gotten to grow more into King’s art lately (and loving it!). It would be pretty cool to see a mashup of Stine and King… that would be super freaky fun! SKSM: Thanks for taking the time to answer my questions. Is there something you’d like to tell our readers? I’ll leave off with, for all those in film, who love film for the sake of film and if your a fan of King; you’re willing to see everything. Even with this being a short, give into your S.K. fandom and watch this. It’s a really good piece that continues from a classic tale we all know from Stephen King stories. He played in Stephen Baxter‘s Dollar Baby Rest Stop as Boris. Christopher B. MacCabe: I am a Canadian Actor of Irish and Scottish descent. I started off as a Sailor working on cargo ships when I was 18 years old, which I still periodically do to this day, I am at sea at the moment. Christopher B. MacCabe: I was 20 years old, an introvert and I went to see a play, Nothing To Lose, by Canadian playwright, David Fennario. I was hooked. I harnessed my will and dove right in and joined a theatre company at 21 years old and my first role was a Sailor in the shipwreck scene of Shakespeare’s Twelfth Night and also as Second Officer. I spent seven years doing amateur theatre and then went on to study at the prestigious Banff Centre, School of Fine Arts for three years. Later I was honoured to join the World Renowned Warren Robertson Atelier in Montreal for several years. 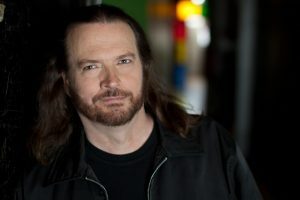 Christopher B. MacCabe: I saw a casting post for Rest Stop on Facebook and seeing it was based on a Stephen King story immediately sparked my interest. When I read the character breakdowns, I submitted myself for the auditions. Christopher B. MacCabe: I think many people dream of living another life, living in someone else’s shoes; creating change in our world to better it; making a difference. The path of a hero can fulfill that dream. Storytellers, I believe are the guiding lights for humanity. Amy Halloran’s clever adaptation along with Stephen Baxter’’s gifted direction, Wyler Diome-Montour’s captivating cinematography and Eric Davis‘s outstanding performance elevates the audience’s experience. Christopher B. MacCabe: Stephen Baxter, the director contacted me by phone, after I sent him my resume and reel. I informed him I was very interested in the project. Being a dialect coach as well, I mentioned that I could do several accents. He asked to hear my Russian accent. I did several versions from authentic to stereotypical. He later contacted me and offered me the Role of Boris. I quess I auditioned by phone. I was very happy. Christopher B. MacCabe: Stephen Baxter is an actors’ director. He has worn both hats. He understands actors and has a way that makes you relax and create and trust. He was well prepared and organized. I wouldn’t hestitate to work with him again. Christopher B. MacCabe: The (awesome) Blood Brothers who did special effects when I got shot and my mouth was full of fake blood, I was always fighting not to swallow it because it tasted so good and it always made me want to smile, like you do with ice cream. Christopher B. MacCabe: I still stay in contact with Stephen Baxter and longtime colleague, Andrew Campbell from Cold Blue Rentals Regd, one of our country’s best Weapons Masters and Armourers. Having worked with him in the past on huge to small projects, hearing he was onboard was a delight, a safe professional, a must with shootouts and I got to act with him as well! I also keep in touch with the Multi-talented Ashleigh Faith Williams, it was her first film role and definitely an Actress to keep your eye on! Christopher B. MacCabe: I am working on a web-series about a handler of undercover agents and a Shakespeare podcast of his famous scenes and monologues. Christopher B. MacCabe: Yes, definitely, The Shawshank Redemption and Dolores Claiborne are two of my favourite films and books. Countless other films and series. Christopher B. MacCabe: Well, that I steer large ships. Christopher B. MacCabe: I want to thank them for enjoying and supporting Stephen Baxter the Director and Amy Halloran’s adaptation of Stephen King’s Rest Stop. A lot of hard work and love was put into this project and the fans support makes it all worthwhile! There are storytellers in all of us! Christopher B. MacCabe: I hope I am privileged to work with Stephen Baxter and his team again. Shout out to the whole crew and cast that brought this project to fruition! Claudie-Ann Landrie our stylist and Liliana Saavedra; thumbs up! She played in Joana Lima Martin‘s Dollar Baby Ayana as Charlotte. Sheila Collins: With pleasure. I am currently working solely as an actor, but I have previously done mental health counseling in a community health center. Prior to that, I worked in the Standards & Practices división of several televisión stations, mostly on game shows (to ensure fairness) and also on a couple of daytime talk shows. Sheila Collins: I’d been interested in acting since early adulthood. But life intervened and I didn’t pursue acting until I entered middle age. During my first acting experience, I knew it was what I wanted to devote my life to. SKSM: How did you become involved in Ayana Dollar Baby film? Sheila Collins: Well, it has a number of compelling themes. It’s a story about overcoming adversity, it’s a love story, and it’s a story about family. Ayana is a young woman who is blind and wants to have an operation that will restore her sight. She’s a college student and listens to some of her required Reading on audiotape. Then one day she accidently meets the Young man whose voice she’s been listening to. They develop a friendship and blossoms into a romantic relationship. Sheila Collins: Yes, I auditioned. SKSM: You worked with Joana Lima Martins on this film, how was that? Sheila Collins: Joana was very professional, encouraging and supportive of her cast and crew, and had a clear visión for how this story should unfold. She was a pleasure to work with. Sheila Collins: I had a very emotional scene to do that required me to break down crying. I have always been able to cry on cue, shed real tears, get the red, runny nose, everything! Joana made sure this scene would be shot on a closed set, so as to respect the demands on my process. The scene had to be shot six times in all for one reason or another. Each time, tears freely fell down my face. Each time, that is, until the 6th time when my tears had completely dried up! It was so weird. We had to take a break to allow me time to recover and be able to produce more tears. We finally wrapped the scene, tears and all, on the 7th try! Sheila Collins: Oddly enough, I have only maintained a friendship with the one cast member that I never had a scene with. Joana returned to be native Portugal after graduating, and my communications with the other actors diminished over time. I remain friends only with Arye Bender, the actor who played the father of the Young man in Ayana’s life. 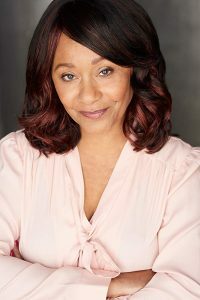 Sheila Collins: I still audition for TV and film, and during 2018 I shot an episode of S.W.A.T., a TV show that is now in its second season. I also appeared in fan film of the Deadpool charácter. It’s called “Deadpool the Musical 2.” In 2017, I appeared in an episode of Grey’s Anatomy, a show that is seen all over the world, apparently. Sheila Collins: Yes, I am a long-time Stephen King fan. I’ve read several of his horror novels and really enjoyed his novel, Joyland, that latest one I’ve read. Sheila Collins: That I whistle really well! Sheila Collins: Just that if you’re Reading this interview, you are probably a writer, an actor, a film maker or all three. Keep pursuing your dreams. Sheila Collins: Thank you, Óscar, for including me in your interview series. She played in Stephen Baxter‘s Dollar Baby Rest Stop as Ellen. 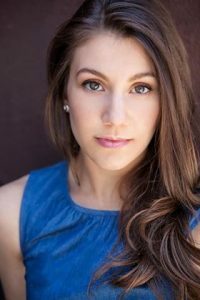 Lorraine Pellicone: I live in Montreal, Canada and have been acting for a few years now. I am the youngest child in my family (I have two older sisters) and my cultural background is Italian. On my spare time, I love exercising, discovering new recipes, and meditating. I am also a classically-trained ballerina. Lorraine Pellicone: The earliest memory I have of this is being about 7 years old and telling my parents very dramatically (with the back of my hand over my forehead, very old Hollywood-style) that I was going to be an actress! Then I dropped out of it for quite a while until I rediscovered it 5 years ago. Lorraine Pellicone: I saw the casting call on Facebook in a Montreal casting group. There was a local film festival running at the time, so we had to submit self-taped auditions online. I filmed the audition after an acting class and Stephen and Amy offered me the role a few days later. Lorraine Pellicone: This story focuses a lot on image; how a person sees themselves vs how they want other people to see them. This sort of image management is a universal struggle and I think the viewers can relate to Dykstra’s confusion between what he thinks is his “real” self (the timid college professor) and what he thinks is a made-up character to sell product (Hardin). Both personalities are a part of Dykstra though and I think watching him discover this is very interesting. Lorraine Pellicone: I auditioned for the role. Lorraine Pellicone: Brilliant. This was one of the most organized and talented crews I’ve worked with. Stephen was considerate and patient, and a great leader. The cast and crew all worked so well together and part of that can definitely be attributed to Stephen’s steady directing. I loved the finished product. Stephen has great vision. Lorraine Pellicone: It was actually my birthday the day we filmed Ellen’s scenes. During the lunch break, in-between takes of Adam and I fighting in the bathroom, the cast and crew sang me happy birthday! It was a pleasant break from the very bleak scenes we were shooting. Lorraine Pellicone: Yes I do. The Montreal acting scene is close-knit, so I see many of the cast and crew at local events. I see Adam most often as we have many mutual friends and have known each other since high school. Lorraine Pellicone: I will be working on some other local short films. Looking forward to what 2019 will bring! Lorraine Pellicone: I’ve seen several Stephen King films throughout the years (Carrie, Pet Sematary, The Shining, and Dolores Claiborne). Truthfully, I’m too afraid of horror films to watch them very often. I’m still afraid of scenes from Carrie and Pet Sematary and it’s been probably 15 years since I’ve watched the movies! Lorraine Pellicone: I have many interests and skills outside of acting. I have a Bachelor of Arts degree from McGill University in Montreal in History, with a double-minor in Political Science and Religious Studies. At one point, I had strongly considered going into International Law. Lorraine Pellicone: Thank you so much for your interest in the film! It was a great experience and I’m so happy to share this work with everyone. Lorraine Pellicone: A shout out to my friends and family for supporting me throughout this fun, busy journey! Cast: Alex Dunning, Nadia Fancher, Ted Raimi, Barry McMullen, Greg Gasman, Beau V. Thompson, Kyle Benham, Alex Westrick, Quentin Malicoat, Zack Dzuba, Mia Dietrich, Taylor Watkins, Gary Kramer, Dave Fancher, Brent Engelmann, Kris Engelmann, Robert Brookey, Darrin Murrell, Sean Orlosky, Ike Wellhausen, Sadik Hrustanovic, Reanna Miller, Matthew Zeller, Iain Van Elk, Avery Elder, Gavin Gremer, Noah Gremer, Samira Zeller, Thomas Zeller. He played in J.P. Scott‘s Dollar Baby Everything’s Eventual as Skipper. Shane Dean: Hello! This is Shane Dean aka Shark. Actor, director, singer, songwriter, producer and fighter. SKSM: How did you become involved in Everything’s Eventual Dollar Baby film? Shane Dean: I became involved with the Everything’s Eventual project after having a successful series of auditions with Director JP Scott and an excellent chemistry with Lead Actor Michael Flores. Shane Dean: I think people are attracted to the story because everything that Mr. King writes is golden and always creates wonderful, thought provoking, and interesting tales. SKSM: You worked with J.P. Scott on this film, how was that? Shane Dean: Working with JP was an excellent experience. He is indeed an actor’s director. A real pro and a pleasure to work with. 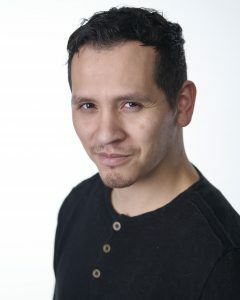 Shane Dean: Probably my most fun or interesting moment in the film was when I had the opportunity to beat up Dinky Earshaw (Lead actor Flores) on camera as I choreographed the fight with Michael upon our meeting during the audition process … Which ultimately helped us land our roles and develop the chemistry we had during filming. Shane Dean: I haven’t really had much contact with the cast and crew lately. Shane Dean: I am currently in the marketing phase of my latest feature films DUSTWUN and Coyotaje. One of wich is already sold to a major distributor and the other is in the Berlin Film Festival. I am also currently in pre production for several projects with UNIVERSAL and a few other choice projects. Shane Dean: Of course I am a fan of Mr. King! I have read several of his works and seen most if not all his films. I thank you and love you all. Happy Holidays around the world! Eric Davis: I’m an actor based in Montreal. I’ve been working in the business for 20 odd years or so. I started out in theatre and eventually moved on to voice over, TV and film. These days I also do a lot of video game motion capture and voice. Eric Davis: I had a chance to audition for the National Theatre School after high school. I wasn’t sure if I wanted to pursue my visual art background or jump off the deep end and try acting. I’d done one high school play and that’s it. I wasn’t even in drama. The auditions were being held in a rehearsal hall at the National Arts Center in Ottawa where they had a production of Phantom of the Opera playing on the main stage. I was so nervous I had to take a walk to try and get rid of my jitters. I stumbled upon the stage door and beyond, the main stage, filled with the set an props from Phantom. I spent the next half hour in awe, exploring that stage and the set pieces. I completely missed my audition but standing on that grand stage and looking out at the empty seats reaffirmed my desire to give the acting thing a real concerted effort. Thankfully, I didn’t miss my next audition. Eric Davis: Stephen Baxter and I had worked together previously on a couple of projects and we got on very well. He contacted me directly about being involved in Rest Stop and I couldn’t say no. Both the chance to work with him again and be involved in bringing a Stephen King short to the screen was ample enticement! Eric Davis: I think it’s a pretty universal human dilemma to ponder our own duality – the pull of light and dark, right and wrong, good and evil, within us. What’s so great about Mr. King’s short story is how efficiently it presents that question. “What would you do in this situation?” It’s simple but profound and, I believe, instantly relatable. Eric Davis: I didn’t audition. Stephen Baxter contacted me directly and asked if I’d like to take on the role. It wasn’t written for me. Obviously we have Mr. King to thank for the character and story. Eric Davis: It was fantastic! Working with Stephen is a joy and there’s an ease to the language of director/actor there that is special. I’d work with him again in a heartbeat. We were also blessed with a great cast and crew which can make or break a production. Eric Davis: There is a moment in the film when my character, John Dykstra, flees the titular rest stop in his car. It was 4 something in the AM and the light of dawn was imminent so we were scrambling to get our last shots done. With Wyler Diome-Montour, our cinematographer, wedged in the passenger seat with the camera, I peeled out of the parking lot. In a way, even though it’s only a couple of seconds in the final film, it was a cathartic moment for me both as an actor and as the character, running away, pedal to the metal, not just from the rest stop and what transpires there but from himself. 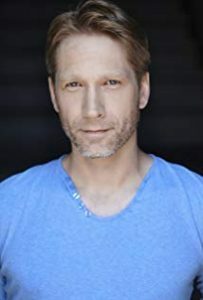 Eric Davis: I’m still in contact with Stephen Baxter and Amy Halloran fairly regularly as well as a few of the other actors. Montreal has a fairly small film community so it’s not uncommon to run into each other at auditions or on different projects. Eric Davis: I just finished working on a big World War II movie directed by Roland Emmerich called Midway, due in November 2019. I’m also currently doing performance capture for a video game franchise that I’m not allowed to mention due to non disclosure agreements! I’m excited about it though. There are some fantastic and talented people involved. Eric Davis: Absolutely. I grew up reading Stephen King as a teenager and while I don’t read him as much these days his works are intrinsically linked to some hugely formative moments in my life. My favourite would have to be his Dark Tower series but I also love a lot of his short stories. It’s great that his stuff is being adapted so much these days. It speaks to how popular and prolific he is. Eric Davis: I think it would probably be how much of an introvert I am personally. There’s a stigma to being an actor that people tend to assume that that person is gregarious and outgoing. That’s part of the fun, though, of inhabiting a character different from myself and living in a different skin, so to speak. Eric Davis: I hope people enjoy the film, of course, but I also hope it inspires thoughts and discussions on the nature of being human – that duality we are confronted with daily. And how a split second choice can determine whether we rise to do good or fall to evil. Eric Davis: That’s all! Thanks. She played in Vanessa Ionta Wright‘s Dollar Baby Rainy Season as Laura Stanton. Jan Nelson: I’m a former college theatre professor and free-lance actress. Jan Nelson: I used to sit and watch the Ted Mack Ameteur Hour when I was probably around 6 or 7 years old and dreamt of performing one day. SKSM: How did you become involved in Rainy Season Dollar Baby film? Jan Nelson: I saw an open audition notice and sent my headshot and reel to Vanessa. I then got asked to come and audition live. Jan Nelson: I think Vanessa did a great job of creating suspense rather than gore. So many films today go for the sensationalism rather than building the story. Rainy Season is similar to a story by Shirley Jackson, called The Lottery, which I used to teach to high school students. SKSM: You worked with Vanessa Ionta Wright on this film, how was that? Jan Nelson: Vanessa was very organized and used everyone’s time well. Jan Nelson: Sorry, I can’t really think of anything. I was only on the shoot one day. Jan Nelson: Vanessa updates us all on FB regarding festivals she has entered with the film, etc. Jan Nelson: I just moved to the Tampa área and am working on getting connected in the film and commercial industries here. Jan Nelson: Sort of – I’m not a fan of gorey stuff, but his work always has interesting psychological aspects. 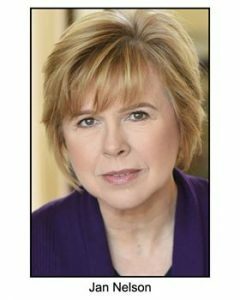 Jan Nelson: While I attended grad school for my MFA in Acting, I worked part-time as a radio DJ. I also am a song writer (melody and lyrics) and have collaborated on 2 full-length musicals. Jan Nelson: Can’t think of anything. Jan Nelson: I don’t have anything else to add that I can think of.